Learn how to live with technology—the healthy way, by optimizing your time spent e-mailing, texting, on Facebook, and web surfing. This program will enable families to communicate better, employees to be more productive, and friends to stay in touch. Sieberg teaches us how to manage and use the technology in our lives to our advantage, without letting it control us. DANIEL SIEBERG contributes to ABC, BBC, and MSNBC and was formerly the science and technology correspondent for CBS and CNN. He lives in New York City with his wife, daughter, and beagle. "Anyone who thinks he or she doesn’t need a digital diet is in denial. Sieberg nails the sad truth of what our tech-triggered ADD has done to us and offers solutions for breaking away--and re-incorporating these same tools in a healthier, more meaningful way. If you've got your nose in your blackberry as you read this, this book is for you." 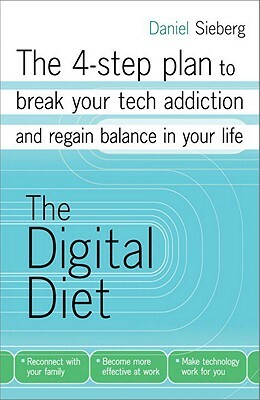 "The Digital Diet is a book packed with wisdom you can put to use right away. It gives you the power to take a huge weight off your shoulders -- and regain control of your life. Sieberg clearly loves technology, and shows how to make it work for you, not you for it." --Will Schwalbe, co-author of SEND: Why People Email So Badly and How to Do it Better. "This book is brisk, lively, and smart. It's also deeply important: many of us use technology too much, without realizing it. Sieberg has had his own problems with overuse and overload, and now he's emerged with a very sensible set of solutions for helping people restore balance to their lives. It's the rare diet book that might actually work." "In The Digital Diet, Daniel Sieberg offers strategies to help us address our tech-dependence and learn to live peacefully with technology. Through well-researched data and guided exercises, he provides a new way to think about, and ultimately change, our connection to the digital world. This book is fun, informed, and incredibly user-friendly."